Amazon Alexa, AirPlay2, and Heos make Denon’s HomeCinema HS2 a feature-rich package. Denon’s HEOS HomeCinema HS2 soundbar and wireless subwoofer is a solid, feature-rich audio system that’s also a smart speaker. Denon has made an extensive update to the HEOS HomeCinema soundbar we reviewed in 2017. The all-new HEOS HomeCinema HS2 doesn’t look radically different, but there are lots of features under the hood that render this a significant update. Indeed, Denon pumped a seemingly endless supply of new tech into this product, transforming it into smart speaker in the process via Amazon Alexa. It’s a very slick feature, especially if you live in a smart home filled with devices you can control with voice commands using Amazon’s digital assistant. Once you’ve activated the HEOS Home Entertainment Skill on your Alexa account (read here for details on that), you’ll be able to say things like “Alexa, play Steely Dan in the living room” or “Alexa, pause the living room” or “Alexa, volume down in the living room,” and so on. As fun as all that can be, I found voice commands to be an incomplete substitute for a remote control—which is a little problematic because Denon doesn’t provide one for this speaker. 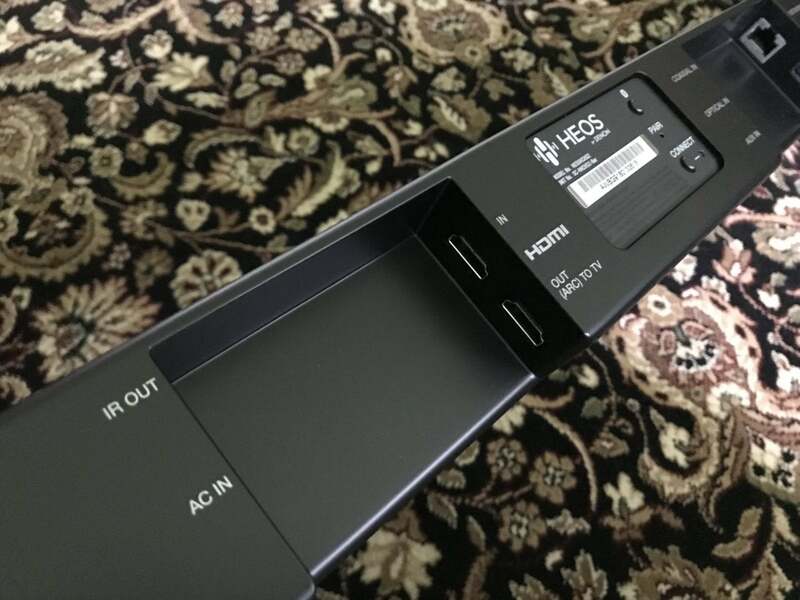 In addition to Bluetooth, the HEOS HS2 soundbar provides both Wi-Fi and hardwired ethernet connectivity. I applaud Denon for including an ethernet port, because that is the most reliable means of connecting the speaker to your home network, provided you have the infrastructure in your walls to take advantage of it. Being a member of the Denon HEOS family, this soundbar can be integrated with other components in Denon’s robust multi-room audio ecosystem. The Heos HomeCinema HS2 has lots of inputs. But you’re not limited to Denon’s tech on that score. This speaker also supports Apple’s AirPlay 2, enabling you to set up multi-room configurations with other AirPlay 2-compatible speakers, such as Apple HomePod and Sonos Beam (note that I did not evaluate this feature). Denon’s HEOS app supports all the major streaming services: Pandora, Spotify, Amazon Music, Tidal, SiriusXM, Deezer SoundCloud, Mood:Mix, Napster, Tunein, and iHeartRadio. You enter in your subscription credentials through the app in order to play content from a particular service. It worth noting here that you can’t currently use Alexa voice commands to stream from Spotify or SiriusXM (such support is labeled as “coming soon” in this Denon FAQ). Driver configuration remains the same as the previous generation: Two soft-dome tweeters and a pair of 2- by 5-inch full-range drivers driven by a four-channel Class D amplifier. The included wireless sub is also driven by a Class D amp. You’ll find it easy to stash the vertically oriented subwoofer anywhere in the room, as it has just a 6.75- by 13.06-inch footprint and is 12.25 inches tall. Allow me to suggest a corner placement if you can swing it, to maximize its somewhat modest low-end frequency response. The included wireless subwoofer has a tall, slim profile. 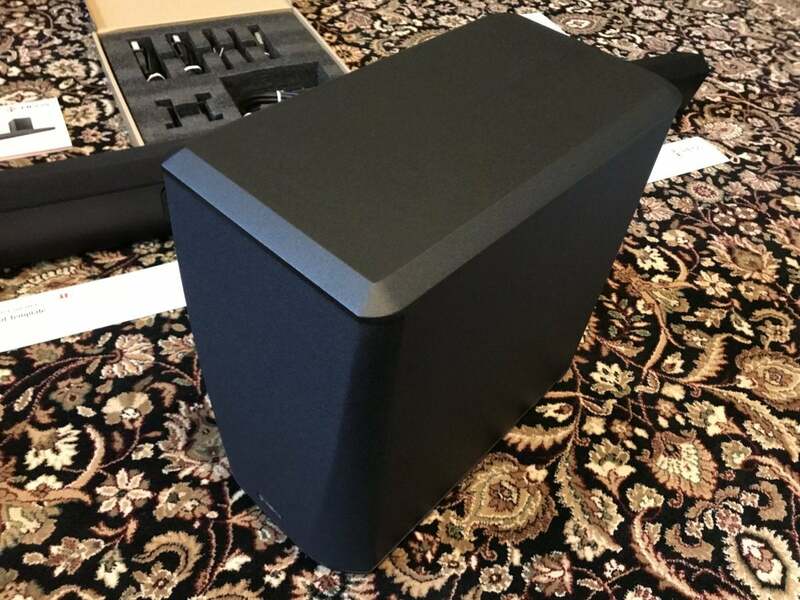 The sub comes pre-paired to the soundbar right out of the box. Should something happen to the pairing down the road, re-pairing the sub to the soundbar is a simple and straightforward process involving appropriately marked buttons. There’s a single HDMI input (with 4K UHD passthrough) on the back of the unit, along with one HDMI out with ARC (Audio Return Channel) support. While HDMI will be the preferred method for most people, coaxial S/PDIF, Toslink optical, USB, and analog inputs are all available. An IR-blaster and input will retransmit infrared signals should the soundbar’s profile block the IR receiver on your TV. Unpacking the HS2 was an easy and pleasant experience. Denon neatly lays out all accessories in their own box. 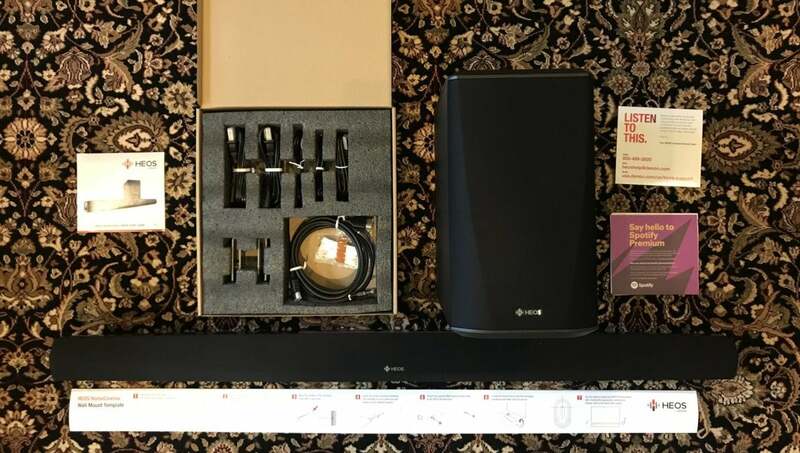 Pulling out the soundbar and wireless subwoofer was a piece of cake. The Denon Heos HomeCinema HS2 package is neatly laid out with everything you need. The soundbar weighs in a few ounces shy of 17 pounds and measures 40.125-inches long by 2.78-inches tall by 4.125-inches deep. It’s easy to lift and will fit in front of your TV or in an entertainment center, using the provided feet. The feet have a rubberized coating that will protect delicate finishes from scratches, and they will also prevent the speaker from sliding around the surface. Alternatively, you can hang the speaker on the wall, using the keyholes on its back. Denon provides a template and pads that will prevent marring, but you’ll need to provide your own screws. 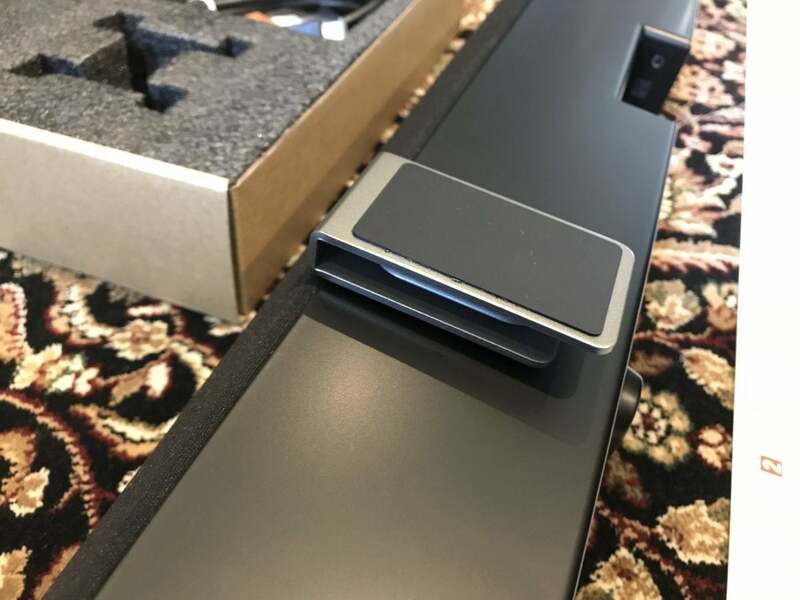 Soundbar placement has an inevitable impact on the speaker’s acoustics. It will sound different on the wall than it does on top of a credenza or placed inside a cabinet. So I appreciate it when the manufacturer provides a contour switch to address these sonic consequences. Denon instead provides separate treble and bass EQ for the soundbar (in addition to a separate volume for the sub) to tailor the soundbar to your particular taste. 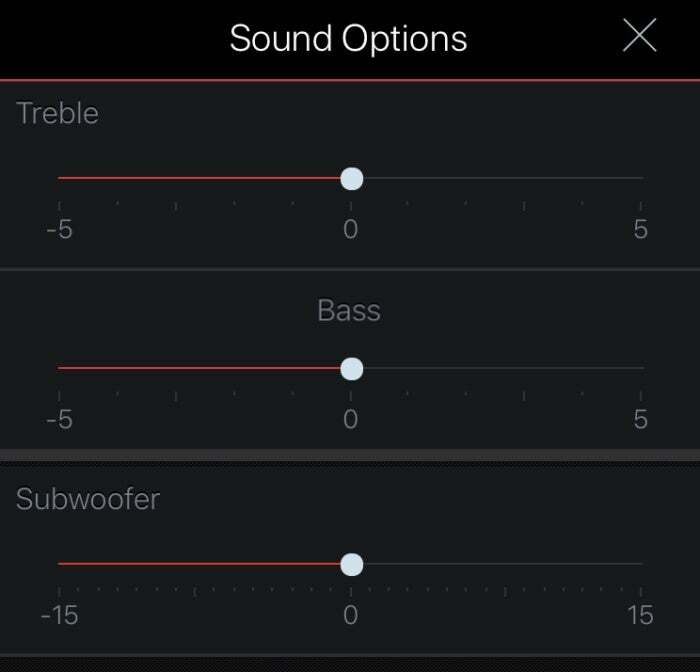 You can adjust the soundbar’s treble and bass as well as the subwoofer’s volume from the HEOS app. 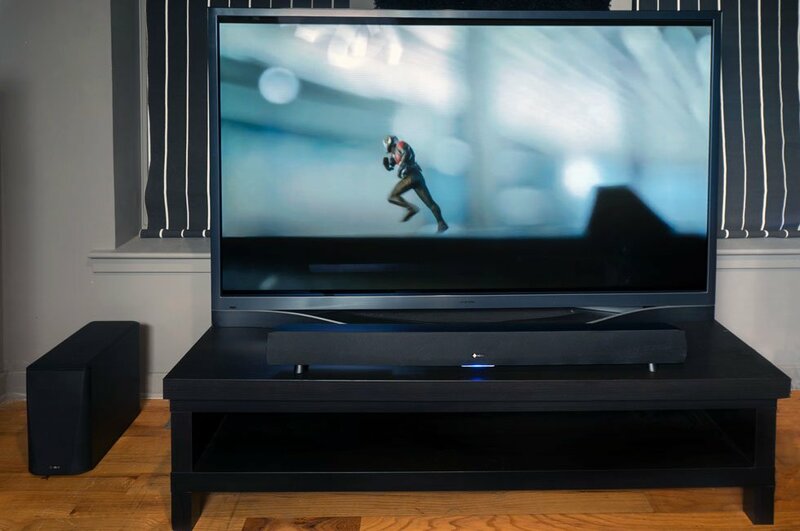 If you’re not already familiar with HEOS, the you’ll likely encounter a speed bump or two while setting up this soundbar—you can’t just plug it in and go. You’ll need to download and install the HEOS app (available for Android and iOS), create an account, and then go through the Denon setup wizard. As previously mentioned, no physical remote control included, but you can train the speaker to respond to basic commands from an existing remote—but only after you’ve set it up with the app. I used an iPhone and iPad for my setup and testing, and I connected the speaker to an Oppo UDP-205 4K Ultra HD Blu-ray player via HDMI. I used my Roon music server, connected via the Oppo, for all my sources. I also tested streaming content via Tidal. 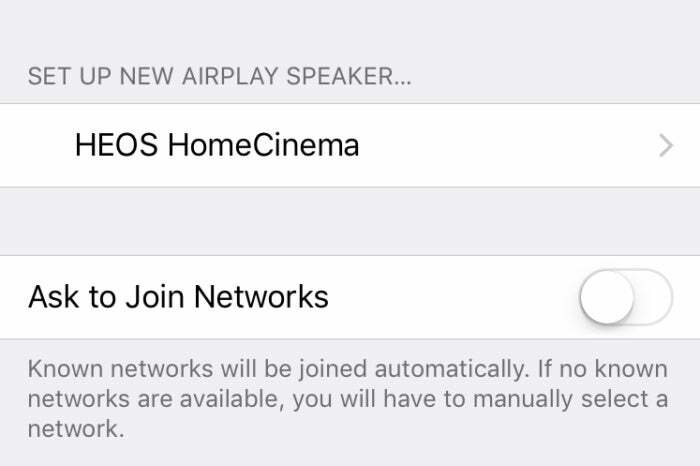 The speaker initially creates its own Wi-Fi network, so I opened my iPhone’s Wi-Fi settings, selected the HS2 from the list (it appeared as an AirPlay speaker), and followed the prompts to connect it to my home’s wireless network. The process was completed in less than 30 seconds: simple, straightforward, and flawless. The Denon Heos HomeCinema soundbar appears as a new AirPlay speaker in the iOS app during setup. I opted to accept a firmware update, which took about 30 minutes to complete, and then began the setup wizard. During this process, you choose how to connect your TV to the HS2 (HDMI with ARC, Toslink, digital coax, etc). I chose HDMI, and I applaud Denon for explaining that in order for HDMI ARC to work, you must first enable CEC on your TV. This is one step that confuses consumers who don’t read manuals and then get frustrated when HDMI ARC doesn’t work. From there, you can opt to rename the speaker (I suggest something simple, such as “Living Room” or “Theater,” because “HEOS HomeCinema HS2” is quite a mouthful when you’re spouting Alexa commands), create rooms, and combine this speaker with any other HEOS-compatible products in your setup. The soundbar comes with a dialog-enhancement feature that’s designed to render onscreen speech easier to hear. You can select from three intensity levels or turn it off altogether. While I found that the feature accomplished its goal, it also created an artificial sensation that became extremely noticeable at the medium and high settings. This speaker performs so well without dialog enhancement that I think most people will be better off leaving it disabled—with one exception, which I’ll get to next. 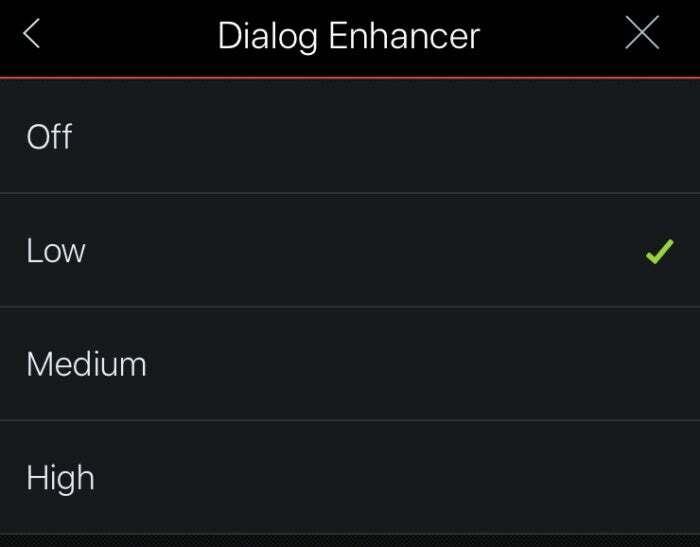 The Denon’s dialog-enhancement feature has three levels, or you can turn it off altogether. The night mode feature, on the other hand, is outstanding, reducing both dynamics and bass. If you’re looking for a soundbar that with superior late-night performance, this is it: It won’t disturb the neighbors or wake up the kids. Night mode does compress things—including dialog—so you might want to complement it with dialog enhancement. 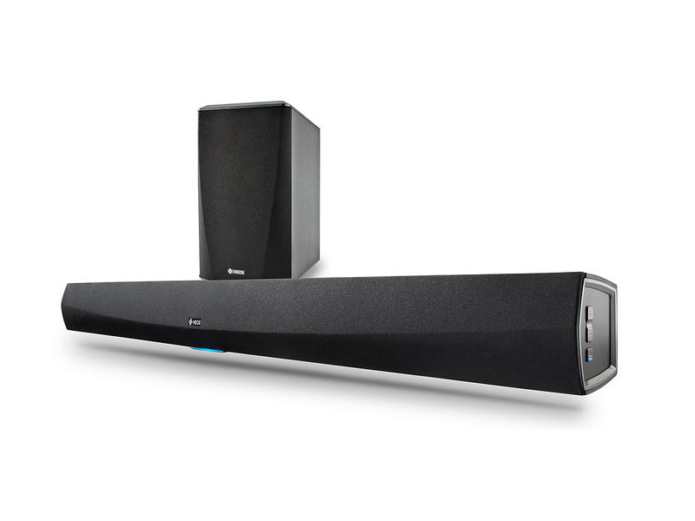 The Denon HomeCinema HS2 is a dynamic soundbar and subwoofer package that brings excitement to any content. I played a variety of music and movies on it and noticed that it automatically switches between it’s predefined cinema mode and music mode. Cinema mode adds some noticeable bass boost. The HS2 does yeoman’s work with music, delivering well-balanced performances from top to bottom. The midrange is clean, though some might find it a hair on the thin sides—something I particularly noticed with female vocalists such as Natalie Merchant, Adele, and Dido. 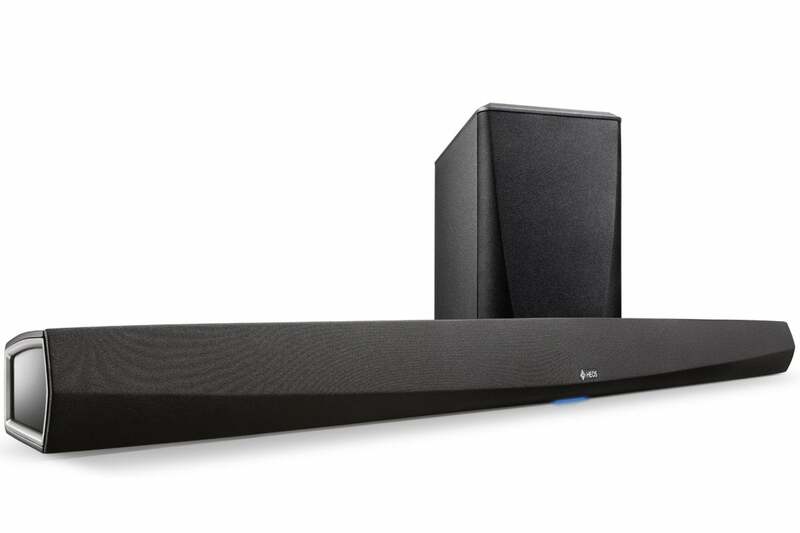 This Denon provides a good, wide sweet spot with both types of material, which is what you want from a soundbar. If you have a wide couch, everyone will get a good experience. The speaker’s metal feet have a backing to protect sensitive surfaces from scratches. I gave the HS2 a good test run with the 4K UHD version of The Greatest Showman. Loren Allred’s vocals on “Never Enough” were clean and intelligible, but lacked a bit of the warmth that comes forth on higher-end systems. The last scene of that movie features the song “From Now On” with a full-cast choreography. This speaker excelled at preserving the song’s dynamics and raw energy; though bass lines and the cast’s foot stomping during the routine betrayed mild midbass bloat. But it couldn’t quite reproduce the deepest bass notes generated by the Recognizers’ thrusters in Chapter 4, “The Grid.” And when Sam Flynn enters the grid at the immediate start of Chapter 4, there’s a deep, rumbling bass that higher-end subs–such as the SVS SB16-Ultra–will reproduce but that the Denon couldn’t. But it’s hardly fair to compare an $800 soundbar/sub combo with a $2,000 subwoofer. Besides, the Denon HS2 didn’t miss a beat with the new 4K UHD version of Jurassic Park, remastered with a DTS:X soundtrack. Even played in 2.1-channel stereo, the classic T-Rex scene came through with all its impact. As director Steven Spielberg intended, I felt the T-Rex approaching long before it made its ferocious entrance, and when its gaping maw opened to issue that guttural roar, I was struck with terror. The HEOS HomeCinema DS2 isn’t a perfect home-theater package, but it sure is an exciting one.